Schichter is the calendar for everyone working in shifts with regularly repeating shifts. 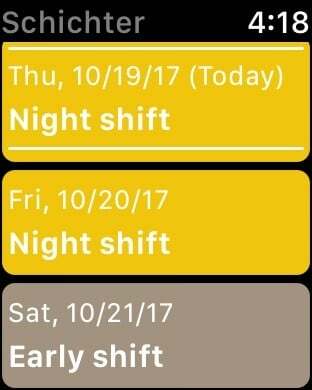 You never know which shift you have when you want to make an appointment? 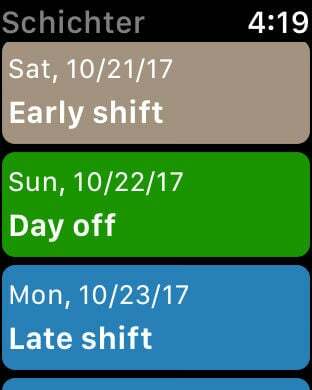 With Schichter you have all your shifts at a glance. - Simple setup with just a few steps. - Color representation of the shifts. - Swap one or more shifts. - Plan your vacation directly in the app. - Share or print your vacation days. 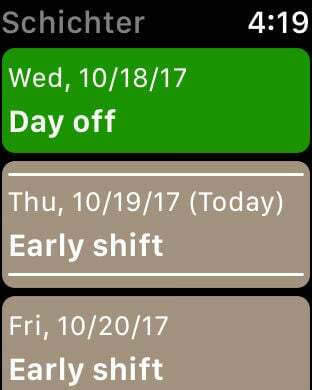 - Make notes for individual shifts. - Backup or share your data. - Export to the iOS Calendar app. - Show events from other calendars of the iOS Calendar app. - Widget for a quick overview of the next days.